Nothing is more inconvenient than an automatic garage door opener that seems to have a mind of its own. And while most homeowners can troubleshoot these devices pretty quickly, there are a few issues that a professional must address. Such is the case with a service call received for a Crofton Maryland Garage Door Opener repair. They reported that their garage door would go up and down on its own, without anyone hitting the switch or using the remote controller. This particular issue could cause a security issue and become a safety concern, especially in a home with small children and pets. Here is a review of the steps our service technician took to address the malfunction. One of the first suggestions the technician made was for the homeowners to check with neighbors. Sometimes they may have a similar remote, and there is a chance it is set to that same code as yours. It is rare, but it does happen and could save hours of searching for an unknown issue. Next, the tech inspected all of the associated wiring. He was searching for any bare spots, disconnections, or short circuits within the system. 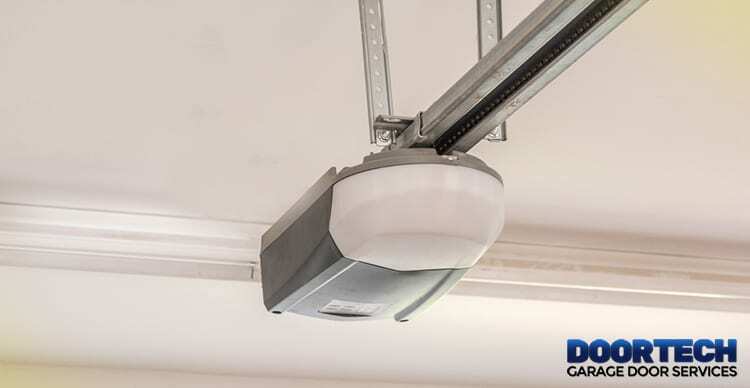 These issues could all be the culprit of a malfunctioning garage door opener. For example, if a bare spot in the wire brushes up against a metal door track, it will activate the motor, and the door will open or close. The tech also checked the cables connecting the sensors at the base of each track. Sometimes critters get in and chew on these cables. If there is an issue with the sensors, the door will even seem to work on its own. He reported that all wires were intact and in good shape. The last issue the technician investigated was the inner workings of the actual garage door opener unit. While it is rare, if a garage door descends on its own it could point to a problem with the opener’s logic board or the circuitry. While this issue is undoubtedly serviceable, such a repair may end up costing as much, or more than replacing the garage door opener. However, if the unit is newer, it may have a warranty that will cover costs. The technician checked with the customers and discovered the unit was quite old. So, after reviewing all options, the homeowners decided to invest in a new garage door opener, with a keypad entry option. In only a couple of hours, they were back in business and better than ever! If you are experiencing a similar issue alike this Crofton Maryland Garage Door Opener repair contact Door Tech Services. Our technician will arrive and provide a thorough evaluation. Stay safe and let the professional assess the situation. Schedule an appointment today.